Beginning next week, the Preservation Society of Charleston gives you unprecedented access to the homes and gardens that make Charleston such a unique and memorable piece of heaven. It’s an opportunity that comes only once a year – and it all begins next week. The Fall Tours: Homes, History & Architecture, which runs from October 5-29, extends a rarefied invitation to go beyond the wrought iron gates and behind the columned doors of some of Charleston’s finest privately-owned Antebellum homes and gardens. As the oldest city in South Carolina, Charleston is one of the few places where you’re likely to meet someone who lives in a home built around 1750. 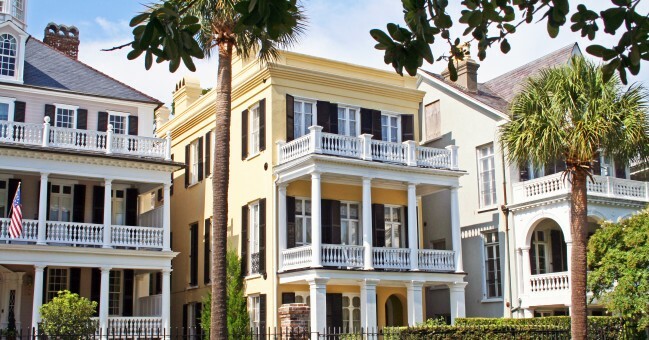 The astounding residential architecture of the Holy City has defined both on daily life and the legendary lore of Charleston. That level of tangible, physical history is integral to Charleston – but usually not available to the public. That’s why The Fall Tours are such a coveted opportunity for tourists and locals alike. The South of Broad tour showcases some of the city’s most architecturally significant properties – and the area of the city you see depicted in many famous etchings, pastels, and watercolors. The remarkable craftsmanship of local artisans and the enduring stewardship of early preservationists, made this one of the most renowned residential districts in the city. Private Garden Tours. Whether you’re a budding horticulturist or a nature lover, you’re invited to go through the iron garden gates and enjoy some of the finest private gardens in the Historic District on this tour. The Battery Tours. Walk through some of Charleston’s most stately private antebellum residences along East and South Battery. From the rooftops and piazzas of these grand houses, built just a few years before the start of the Civil War, Charlestonians watched the firing on Fort Sumter that began the Civil War in 1861. Up Close and Personal. Led by an expert in their field, these tours live up to their name, treating guests to in-depth interpretations and access to the Holy City’s most iconic homes and gardens. Walking Tours. A family-friendly introduction to Charleston’s remarkable architecture, these walking tours are both fun and educational for all ages. You’ll learn to identify the iconic physical elements of historic homes and how they relate to the various periods in history. The Grimke Sisters. If you’re a fan of Sue Monk Kidd’s Invention of Wings, this tour was made for you: follow in the Grimke sisters’ footprints to see, feel and hear how life in Charleston was for both whites and blacks during the 1800s.